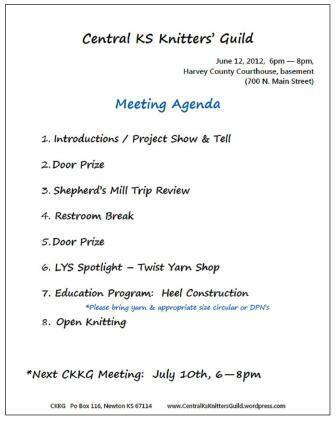 Grab your knitting and a friend and join us for the June Knitting Guild meeting! June 12th from 6-8pm at the Harvey County Courthouse (Newton, Main & 7th streets). *Check our Ravelry page or contact us for carpool details. We have several new members from the Derby and Wichita area! Since we will just be getting back from the Shpeherd’s Mill Tour, I’m sure we will have lots of exciting news and pictures to share! Ticket update: we still have a handful of seats left for the trip, so get your tickets soon. We can only hold 45 knitters on the bus!